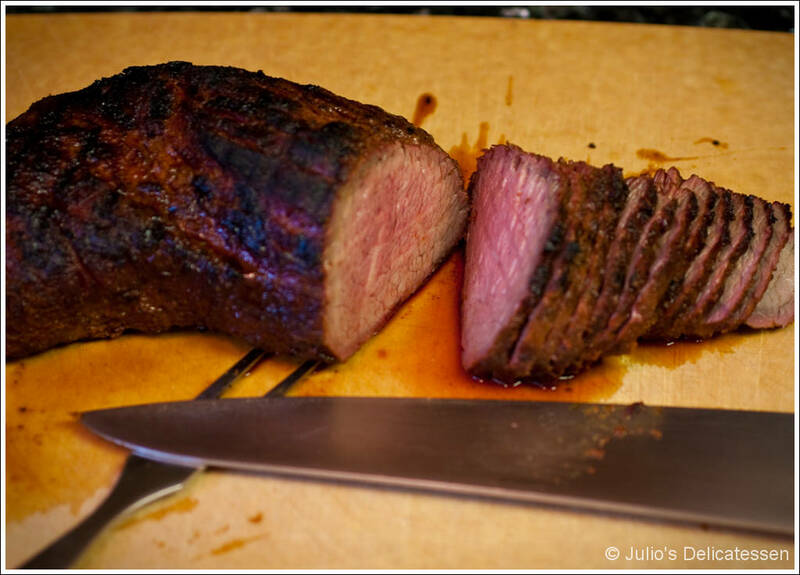 When we first moved to California, I saw tri tip everywhere. It wasn’t a cut I was accustomed to seeing in the other places I’d lived, and for some reason I didn’t pay much attention to it. Eventually I had it cooked Santa Maria-style and loved it. This has become the stand-by cut of beef I serve if I want to cook something on the grill. Traditionally, Santa Maria-style barbecue is cooked over an oak wood fire, so adding a couple of chunks of oak to the coals makes all kinds of sense. Mix first five ingredients in a bowl, then rub into all sides of meat. Cover with plastic and place in fridge overnight. At least 30 minutes before cooking, remove from fridge. Heat grill to 600 or 650 degrees. Sear meat for about 3 minutes per side. Remove from grill and wrap in foil. Bring temperature down to 350 degrees or so. If you like, add a couple of chunks of fruit wood to the coals. Remove the meat from the foil and place back on the grill, cooking ntil it is exactly 125 degrees. Immediately remove from grill, wrap tightly in foil (you can re-use the foil from the previous step if you like), and allow to rest for 10 – 20 minutes. Slice very thinly across the grain (which may not be consistent from one end of the roast to the other, so pay close attention to each slice).